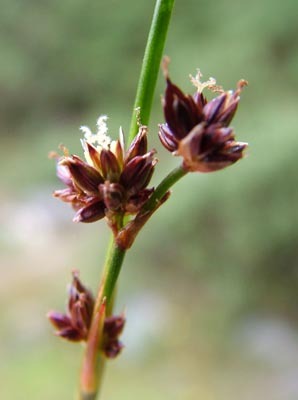 The red colouration and dwarfed structure on this Jointed Rush shows that it has been parasitised by Livia juncorum - a tiny fly that lays its eggs on the growing tips of the plant. The stunted growth forms a gall that provides a feeding and living space for the grub. The right hand image shows a normal flowering head. Juncus articulatus. Two shots of a Caddis Fly on Creeping Thistle. One of the Limnephilidae, about 15 mm long, excluding antennae; 30mm overall. And here's a much smaller Caddis - Tinodes waeneri - about 8 mm long. This small cushion-forming moss has capsules that are about 2 mm long. Ptychomitrium polyphyllum. Here's a better shot of the 10-spot Ladybird larva. One of my water-on-web shots to finish.